In April we told you that this remarkable Girl Scout Brownie Troop set aside money from their cookie sales to make a donation to Walk4Water6, and that they were busy soliciting sponsors for their participation in the Walk. At that time the girls hoped to double their $250 W4W5 donation, but in fact, they turned in a donation of $710.72!! Indeed, it was a delight to have these girls join us for W4W6. Prior to the Walk they studied World Vision’s 5 elements for WASH and prepared a mini display which they set up at the Walk. 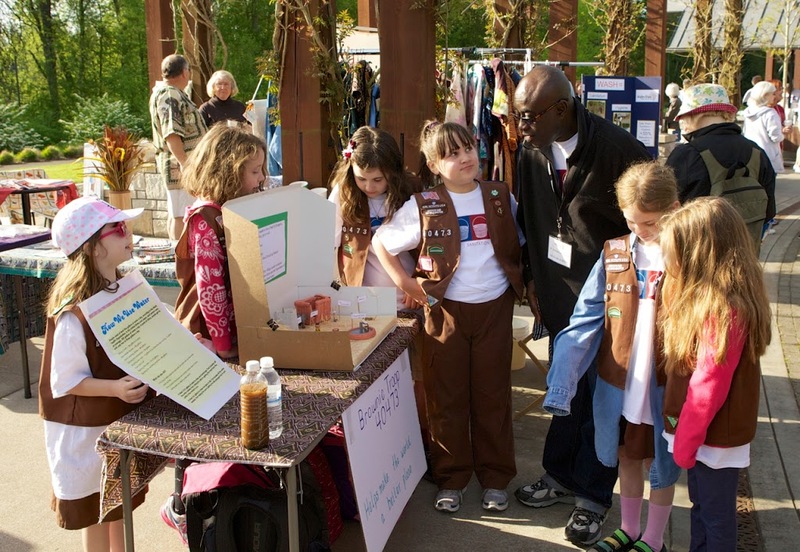 They spoke fluently about the need for accessible, clean water and the solutions that World Vision provides as they presented their display alongside information about water conservation in their own community. It was a joy to watch and listen as they dialogued with Emmanuel about the WASH needs and solutions in Zambia. Clearly these girls are engaged in their mission to Make the World a Better Place! The girls enjoyed finding themselves featured in this W4W6 Oregonian report and we enjoyed having them participate in the Walk. As Emmanuel urged us in his opening remarks, As You Walk, be filled with joy….you are using your time to save lives. 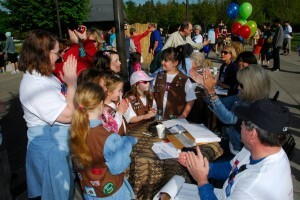 Thank you for contributing to the joy, Brownie Troop 40473!! 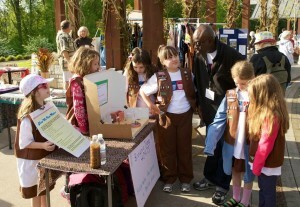 Share the post "W4W6 + Brownie Troop = Life-Changing Joy"
Don't miss news and event updates from WaterAfrica! You can unsubscribe at any time. WaterAfrica, a 501(c)(3) nonprofit corporation, supports World Vision’s work in rural Zambia by raising awareness and funds to bring safe water, sanitation and hygiene to villagers, transforming lives in the process. Donate by Credit Card or Paypal to make a one time gift, or partner with us by signing up for repeat giving.